We are no longer bouncing between two houses and living out of boxes. In fact, the only boxes we have that have yet to be unpacked are in our gameroom and Jon's office. Let's just say that I can barely move this morning. Moving is HARD WORK!!! The fact that our house will be filmed for national TV on Sunday sped up the moving/decorating process quite a bit. We have done so much in the past couple of days, it's exhausting to think about. 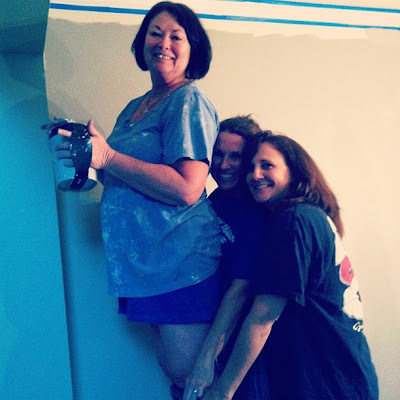 We had painters last Wednesday for the two story areas and then Friday night we had such a fun night with my parents and family friends painting and doing projects around the house. Seriously...you find out who really loves you when you move! 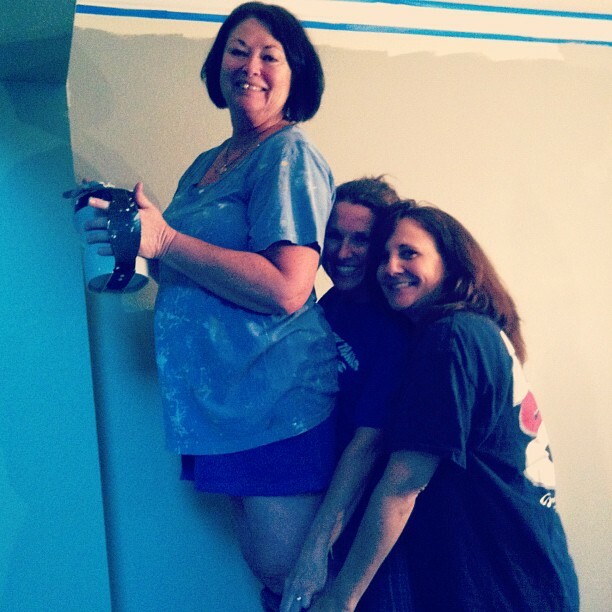 I got home from work on Friday and my mom and some of the "Bunco Babes" we already painting. My dad ended up staying past midnight painting our master bedroom and we were up past 2 mounting our new TV. Jon and I just kept talking about what a blessing it is to be surrounded by friends with such giving hearts. We had friends fixing toilets, installing lights, hooking up our washer dryer...all out of the kindness of their hearts! One of Jon's buddies came in for the whole weekend just to help us move. Talk about a good guy. Unfortunately Jon and Kevin were our only movers but they had fun making the heavy lifting a workout. Turns out the electricity in our old house had been turned off so I couldn't vacuum or use water to clean...whoopsies! Jon's bff stopped by to help unload the Uhaul which was a blessing to have another set of man hands haha. My parents also came back over to help finish some painting and put together our new dining room chairs. Here is a sneak peek but I have to say I am obsessed. Call me crazy but I had a blast organizing and color coding our closet. Our closet is massive compared to the shoebox we had before but it filled up fast! Ernie is so funny, he won't let me out of his sight. He even comes into the water closet with me! Literally the only time we sat down this weekend was yesterday at church. We have been go-go-go since we closed on the house 2 weeks ago but it has been so worth it. Tonight we have a few things to do but for the most part, we are going to take the night off. Thank you all for your well wishes and support! linking up with Jenni today! I'm excited to see your episode! Looks like you're getting all settled in! I'd love to come help with some painting...fire up the jet? those chevron walls are looking mighty perfect and your furbaby looks real handsome with the new couch. eeeek! I love it so much! Can't wait to see it all finished!!! I love everything about this! Can't wait to see the final product. 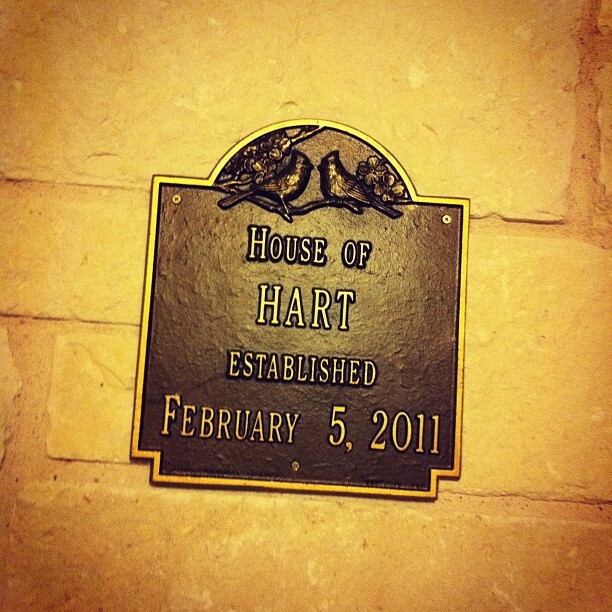 And of course, that "Hart" plaque is so perfect. Happy Monday! How exciting that you're going to be on TV! The chevron wall is such an awesome concept. And I'm love with Ernie...could he be any cuter? Ah! Everything looks so great :) Those dining chairs are fantastic, and the chevron wall? Love. OMG it looks so good already! I am SO OBSESSED with that couch. And your dining room chairs. And that house sign. And that chevron wall. And that adorable puppy. HAHA I think that's it. But I think that's only because that's all you've shown me. HAHA :) Good work girlie! Congratulations! Moving is soso tough, but it's worth it. As tiring as it can be, the moment you get to sit down, look at it, and know it's finished, is SO satisfying! The house is looking SO good! The little sneak peek of the dining room set reminds me that we SOMEHOW relatives in a past era haha. I love that style and have to say, I would have chose the exact same chairs! Glad you got a little rest on Sunday...what a big undertaking getting a home is! Love you! That is so exciting! We we're also blessed when we moved into our home by our church family. It's neat to see the body come together and help. I'm so excited for you! your house looks adorable, and I can't wait to see the chevron wall. I bet it's gorgeous. I am trying to convince my husband to help me with one. I love them! 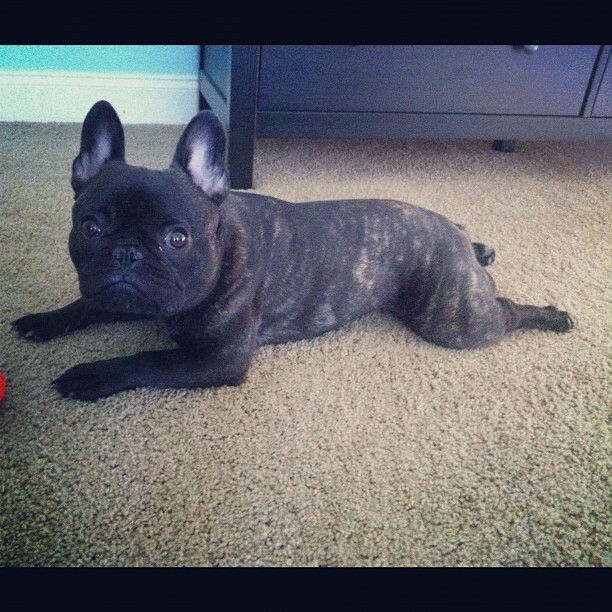 As always Ernie is the cutest Frenchie alive. I want to come steal him for a play date with my bully! EEEk! I love it all! So excited for you guys :) Congrats again! Whoohoo! You know this is like torturing a kid waiting at Christmas for Santa! Ruthie Hart is a tease! Wow! What a ride! It's kinda nice to have things (deadlines) push us to get things DONE, isn't it? Although it's stressful at the time, it might have taken you months to finish all those projects without them! Can't wait to see all the "afters" :-) Welcome home! These look amazing!!! I cant wait to see the episode! Your house look awesome so far from what I can see! I'm exhausted just reading this! What a blessing to have such great people in your life....welcome home! 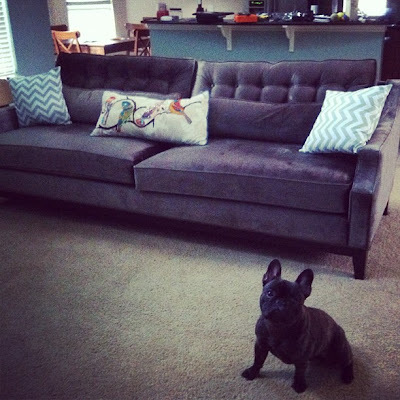 LOVE your new couch!! The house looks wonderful...I know you guys have to be exhausted! Such an exciting time! I love looking at pictures of the house and can't wait to see the episode of House Hunters. I can't wait to see ya'lls episode of house hunters. What is Ernie thinking about the new digs? Can't wait to see more of the finished product! 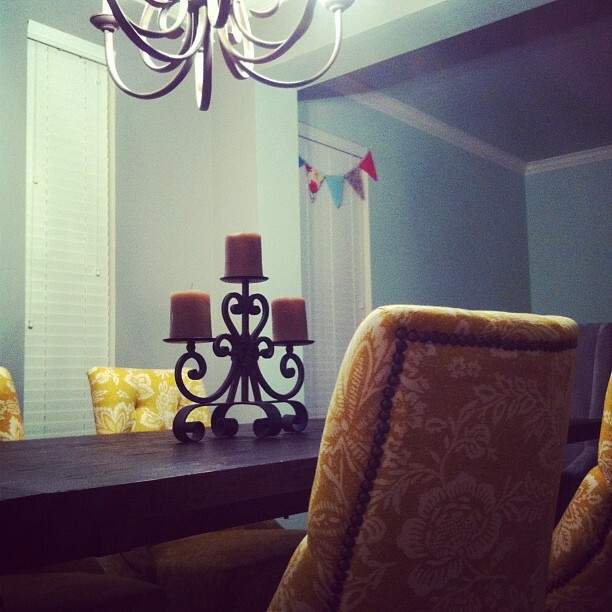 Love your dining room chairs, so nice and plush looking. 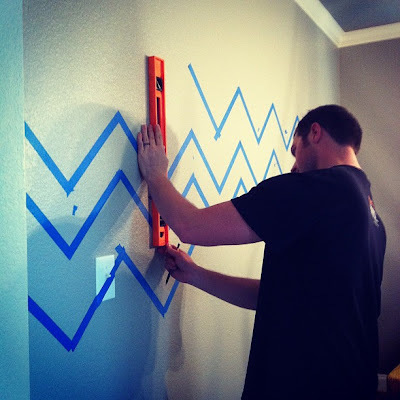 I'm wondering what colour the chevron wall is painting - can't wait to see how it looks! I LOVE your dining room table! Do you mind sharing where its from? :) The house looks like it is turning out beautiful! I love the chevron and can't wait to see y'all on house hunters.. it's my favorite show! I absoutely love your yellow dining chairs!!! Where did you get them! ?